We must stay, and we must accompany the Central African Republic as long as it needs the support of the international community. “We went to the Central African Republic because there was a need,” Mr. Onanga-Anyanga told UN News in an interview while in New York to brief the members of the Security Council on the situation in CAR. The UN integrated peacekeeping mission in the Central African Republic, known by its French acronym, MINUSCA, was established by the Council in April 2014. Clashes between the mainly Muslim Séléka rebel coalition and anti-Balaka militia, which are mostly Christian, plunged the country of 4.5 million people into civil conflict in 2013. According to the UN, more than half the population is in dire need of assistance. Despite significant progress and successful elections, CAR has remained in the grip of instability and sporadic unrest. Mr. Onanga-Anyanga told UN News that it is still “too early to disengage,” and the Security Council “did the right thing by renewing MINUSCA’s mandate.” Last November, Council members extended the Mission until 15 November 2018 and authorized an increase of 900 additional troops to enable MINUSCA to carry out its mandate more effectively, especially in light of the upsurge in violence at that time. The Special Representative, who is also the Mission's chief, said MINUSCA should be able to “accompany the authorities of the Central African Republic, which are taking more and more responsibility, to reduce the main threat facing the Central African society, which is the presence of a large number of armed groups, which are extremely fragmented and whose activities unfortunately cause so much concern to the Central African society. “We must stay, and we must accompany the Central African Republic as long as it needs the support of the international community,” said Mr. Onanga-Anyanga. As for progress made, he highlighted security and defense sector reform, undertaken with the assistance of the European Union (EU); the revival of the judicial system, with trials in Bouar and Bangui, of former perpetrators of the violence that has affected the country since 2013; the establishment of mechanisms of transitional justice, and the restoration of the authority of the State on the whole territory. Regarding the recovery of the Central African economy, the Secretariat of the National Recovery and Peacebuilding Plan (RCPCA), the main support tool for this recovery, had been set up a few months ago. Mr. Onanga-Anyanga said the Government has clearly affirmed its political will to create an environment conducive to boosting the private sector development. However, there must be “a security context that allows to leave the capital” Bangui, he said. The help given to the Central African Republic can only be limited in time [and] everything must be done to ensure that there is a dynamic, autonomous, and above all, indigenous private sector. By creating gradually zones of stability, “we hope the private sector […] can flourish.” But he warned that “the help given to the Central African Republic can only be limited in time [and] everything must be done to ensure that there is a dynamic, autonomous, and above all, indigenous private sector that can create wealth, without which there will be no job creation, [no] long-term stability”, he added. Regarding implementation of the Secretary-General’s zero tolerance policy on sexual exploitation and abuse by peacekeepers, the Special Representative highlighted the measures the Mission has taken since such cases of abuse were revealed. “Three years ago, we woke up to a nightmare. We all learned about the abuses that had been committed in CAR […] on the part of our troops who were sent to the Central African Republic to protect the civilian population but ended up committing crimes,” he said. “Since then, measures have been taken, extremely strong measures. Entire contingents have been sent back from the Central African Republic,” he explained. Mr. Onanga-Anyanga said the policy aims to empower troop-contributing countries, while not stigmatizing any specific country. “We cannot afford to increase the suffering of these people,” he said. He went on to say that such measures are being rigorously applied. And while the problem has lessened, “our goal is zero. It is unacceptable that even one of our contingents or civilians could engage in activities where they would use their status to abuse other people,” he concluded. 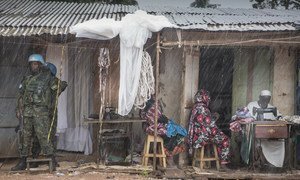 The violence plaguing communities across the Central African Republic (CAR) is a reminder that despite the efforts of all stakeholders, the path to peace, stability and reconciliation in the country remains long and difficult, a senior United Nations official told the Security Council on Thursday.